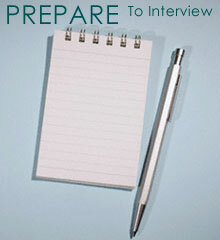 In order to impress a potential employer in an interview, you need to be prepared. It is essential to arm yourself with the knowledge, skills and tactics necessary to sell yourself and not sell yourself short. And that begins with doing your homework. The more you know about the company, the better your chances of getting the position that you want. There are numerous research RESOURCES available today. FACT: Many Employers have been known to stop interviews because a candidate did not do their research, and knew nothing about the company and position they were interviewing for!